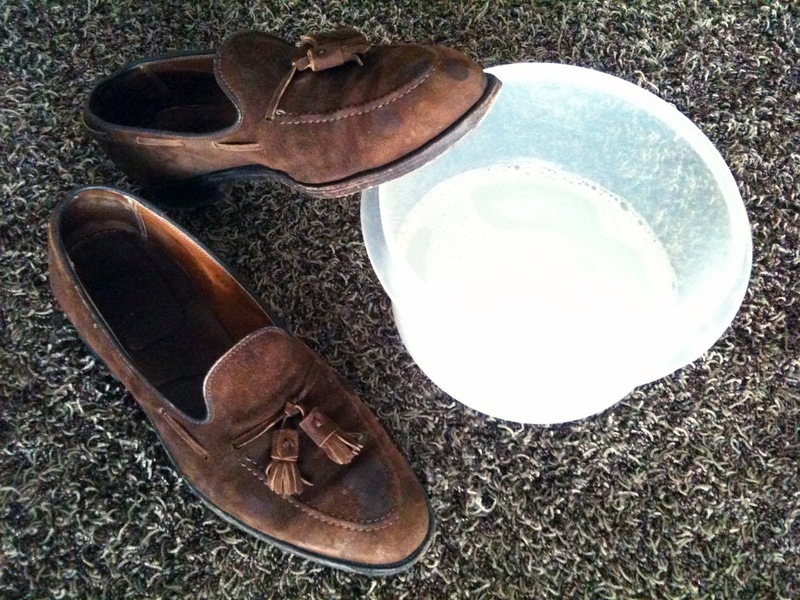 THE NORDIC FIT: How to heal your suede shoes after a night out? 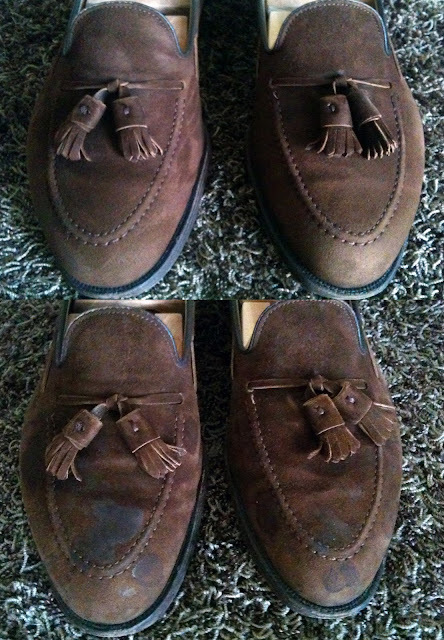 Snow and chemicals during the winter, mud during the fall, dust during the summer and beer after a night out - this is what your suede shoes have to endure. How to keep them healthy? Read on and you will see a transformation that a pair of my own will go through. 1. 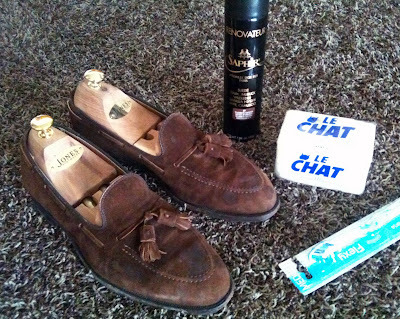 You need a chunk of Marseille soap, a hard or medium toothbrush and a silicon-free suede spray. Go for Saphir, but companies like Allen Edmonds offer a good and cheap alternative. You can use neutral or colored spray, but make sure the color is right or go with neutral. I will use a mid-brown Saphir suede renovator spray in this case. 2. Take a bowl and make a room temperature mixture of water and the soap. Don't use too much soap, as the liquid shouldn't be too strong. 3. 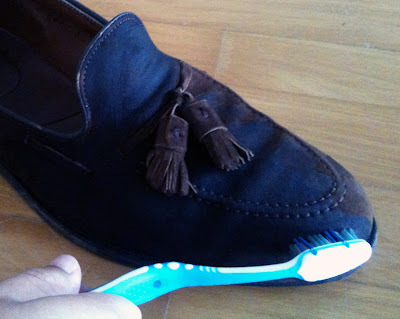 Take the tooth brush and start applying the diluted soap and water on the shoe. Don't use too much water, as we don't want the leather to soak too much of it. Use circular motions. After you've washed the whole shoe, wash the remains of the soap liquid lightly with water. 4. After washing both shoes, put them somewhere to dry. Make sure they are in a dry place with at least decent air circulation. Don't put them anywhere too warm (radiator eg.) as that will destroy the leather. Let them dry without shoe trees for at least 4-6 hours, then set the trees in so that the leather will have good support. 5. Let them dry, two days should be enough. 6. 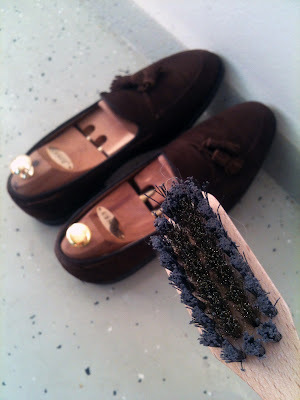 Brush them with a suede brush. Mine here is from Saphir, but anything made for this purpose should do. Make sure the suede is properly 'fluffy' before you move into the next step, as it is important that the suede is not laying flat after the washing and will be equally sprayed. 7. Cover the foot openings with something. Especially if you are using colored renovator spray. I've used paper this time. Spray them thoroughly from about a 20 cm distance. 8. Let the shoes dry overnight. Add shoe trees. See the paper I used to cover the inside of the shoes and you can see why I did it. 9. Brush them again and you're done. 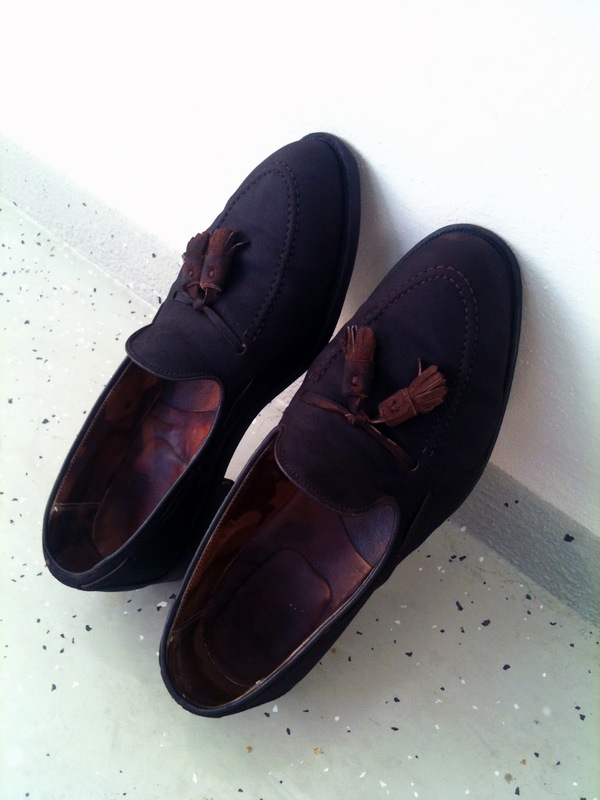 Enjoy your healed and now happy pair of suede shoes. See the difference in my pair, which in real life is ten times bigger due to the lack of good camera during the process. Saphir's spray does magic on the color, and what my tassel loafers looked like a few days ago is nothing more than a memory anymore. Nice article! I have never considered cleaning suede using this process. 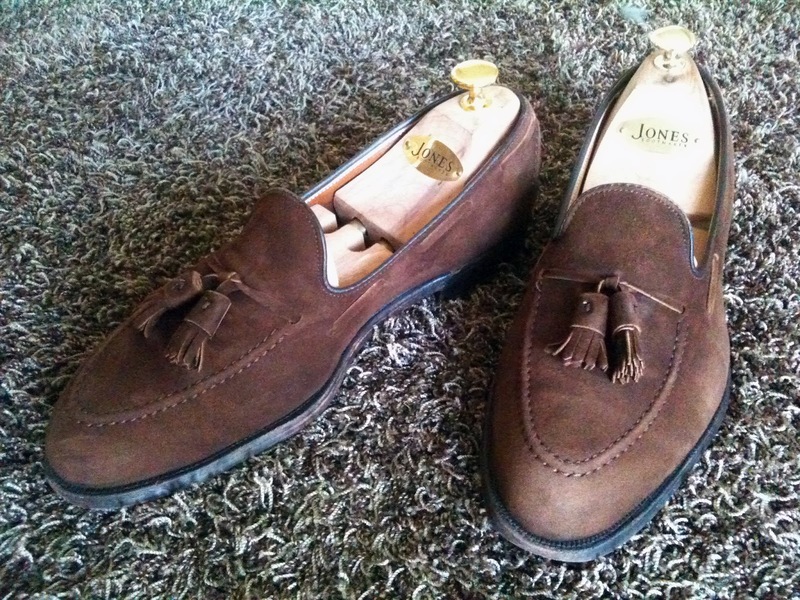 I have suede shoes and, during the summer, I wear suede and nubuck lace-up oxfords more frequently. This means that they are more prone to dirt with the increased wear during the summer months. 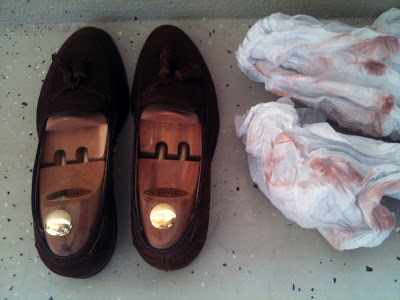 To clean them, I usually use a suede block (looks like a large eraser one would use for drafting) and a special suede brush to brush the residue away. 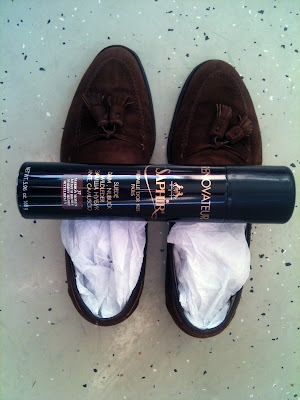 This method works great but works better when the shoes are sprayed with a water repelling spray or a stain repelling spray afterward. I will have to try the Saphir spray that you've discussed.